Congratulations to our 2019 Union League of Philadelphia Good Citizenship Award Winners! 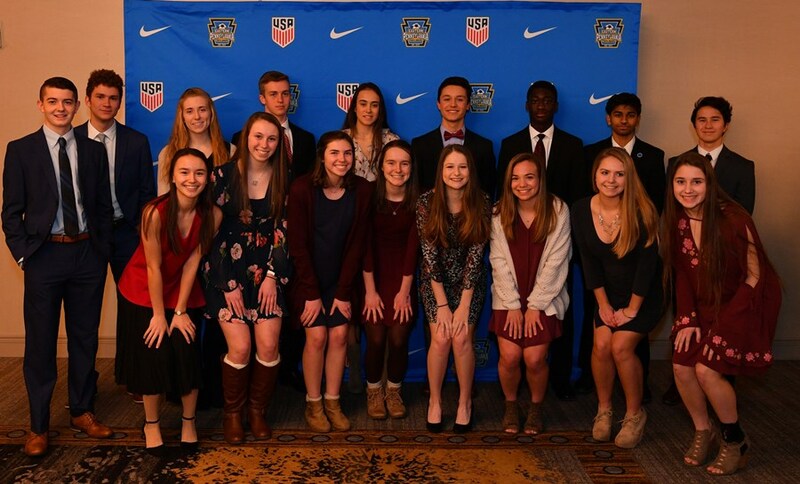 Each year, Eastern Pennsylvania Youth Soccer accepts applications from high school juniors, active within Eastern Pennsylvania Youth Soccer, for The Union League of Philadelphia's prestigious Good Citizenship Award. Award winners will be eligible to apply for a college scholarship provided by the Union League worth at least $5,000/year. The scholarships will be awarded during the student's senior year of high school. The application should not exceed five pages in length. Concision is valued. Applications should be submitted to info@epysa.org. Please save it as one PDF with the title "Last Name, First Name - Union League." Each winner must be able to attend an all-day leadership program and awards dinner at the Union League on Wednesday, May 1, 2019 (Good Citizen Day). The Union League of Philadelphia is located at 140 South Broad Street, Philadelphia, PA 19102. Recipients will also be recognized at the annual Eastern Pennsylvania Youth Soccer Awards Banquet on Friday, February 22, at the Sheraton Valley Forge. Please mark both of these dates, Good Citizen Day and the Awards Banquet, on your calendar. For any questions regarding the application process, email info@epysa.org.